Let’s face it: we all want firm, blemish-free skin that seems to radiate from within. Oh and hold the wrinkles thanks! There’s evidence that eating more carotenoid rich foods, like fruits and vegetables, helps improve people’s natural complexion. They’re also generally rated as looking healthier and more attractive. Fruits, vegetables, and other healthy foods are also high in nutrients that are essential for skin repair and protecting your cells from sun damage. So before you spend tons of money on skin creams that promise these results, try adding these 15 foods for healthy skin first. Let’s see what makes these foods so darn good for your skin. 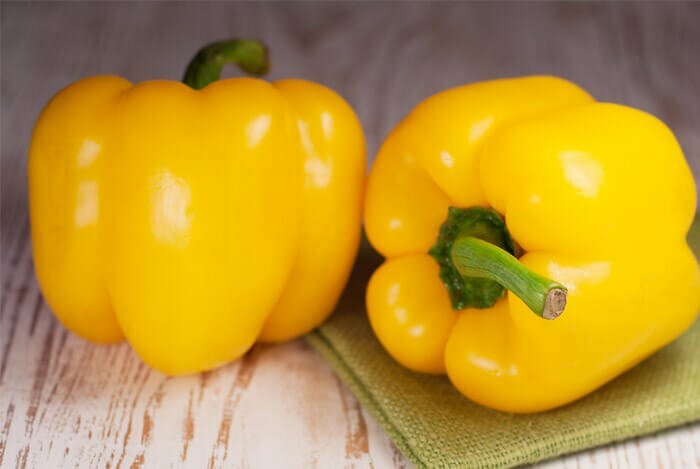 One yellow bell pepper has 341.3 mg of vitamin C, or a whopping 569% of your daily value (DV). According to researchers from one study, women who ate the most yellow and green veggies had fewer wrinkles than those who only ate minimal amounts of them. What’s even better is that researchers noticed that the women had especially less-noticeable wrinkles in the crow’s feet area, which is a tell-tale spot for signs of aging. Expensive eye wrinkle cream? See ya later. Another study verifies that by increasing vitamin C in your diet, you’ll not only notice fewer wrinkles, but you’ll also experience less dryness. Anyone who’s ever suffered with the uncomfortable tightness and skin peeling associated with dry skin should definitely increase their vitamin C intake. 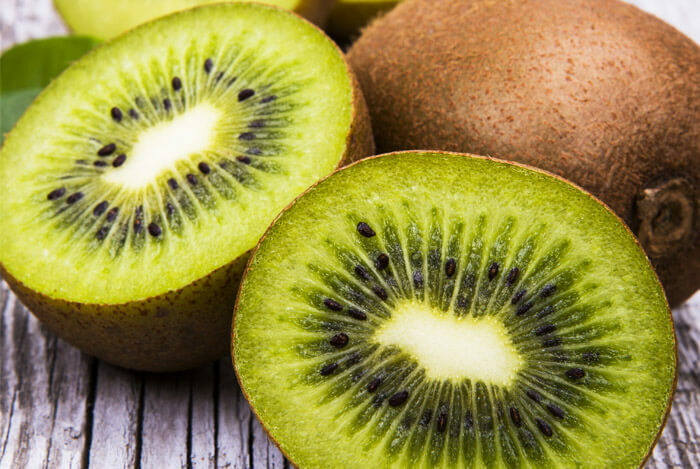 If you’re looking to add a quick and easy dose of vitamin C, reach for a kiwi. Just one of these little green guys will give you 64 mg of vitamin C, which is 107% of your DV! Seriously, if you’re not eating tomatoes every day, you need to get on it! 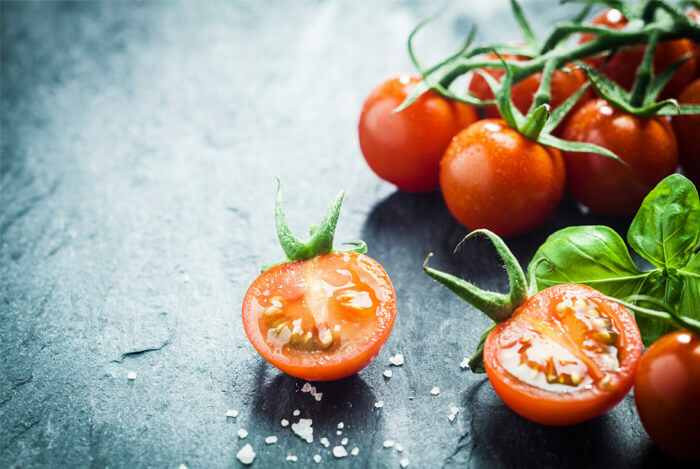 Tomatoes are jam-packed with powerful antioxidants and tons of vitamin C. Just one cup of tomato juice has around 45 mg of vitamin C, or about 74% of your DV. You’ll be well on your way to glowing skin with tomato’s help. 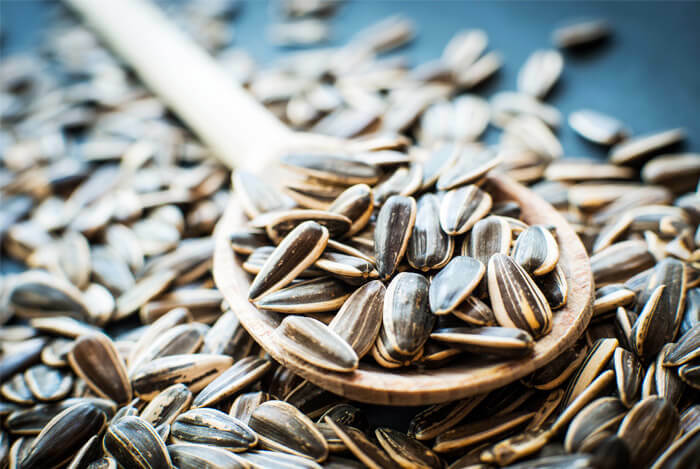 One ounce (or two tablespoons) of sunflower seeds packs 10.2 mg of vitamin E. That’s 49% of your DV! As if you needed another reason to love those amazing almonds, go ahead and add healthy skin to your list of benefits. 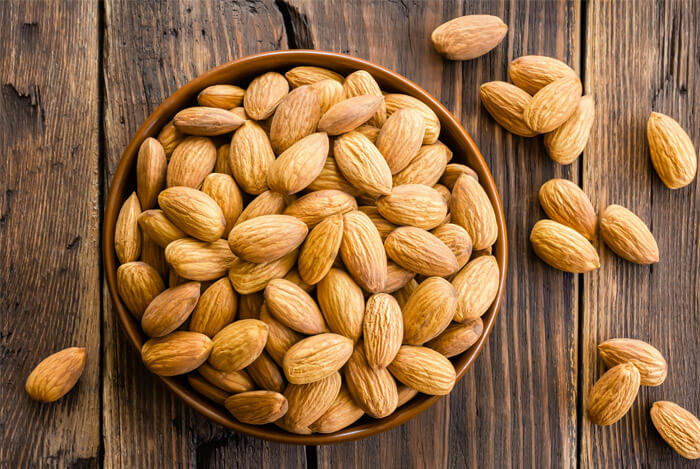 One ounce of almonds has 6.9 mg of vitamin E, which equals 35% of your DV. 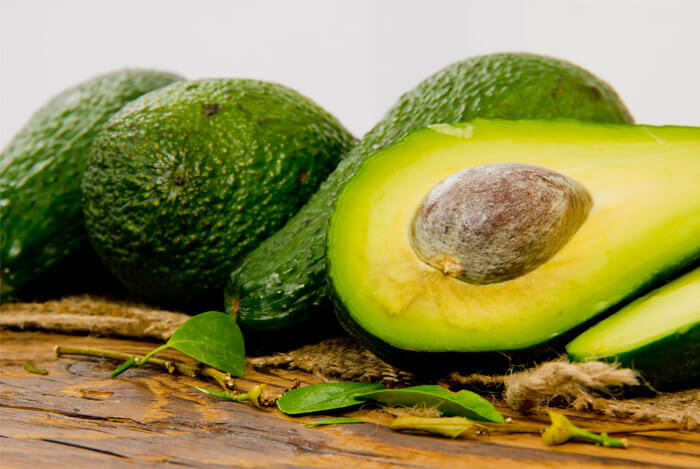 There’s 4.2 mg of vitamin E (20% DV) and 12 mg of vitamin C (20% DV) in one delicious avocado. 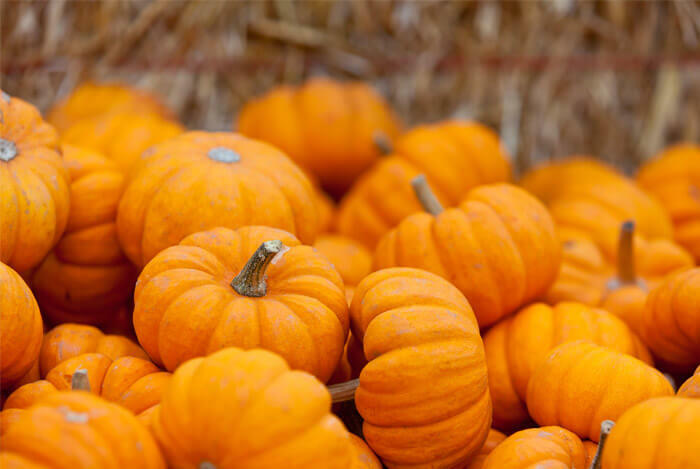 Every fall we’re inundated with pumpkin this and pumpkin spice that, so isn’t it wonderful to know that pumpkin’s one of the healthiest foods for your skin? Pumpkin’s warm orange color comes from the extraordinary antioxidant beta-carotene. When you eat foods with beta-carotene, your body converts it to skin-loving vitamin A. One cup of cooked pumpkin has 38,135 IU of vitamin A, which is (get ready for it), 763% of your DV. 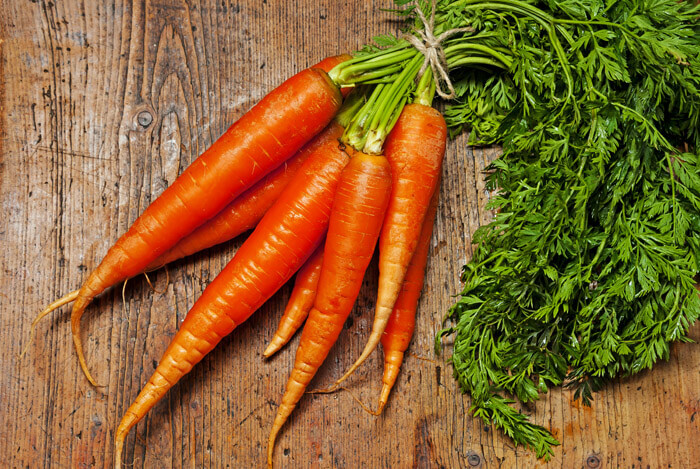 Carrots are one of the best sources of carotenoids you can find. Animal sources of zinc are better absorbed by the body than plant sources. 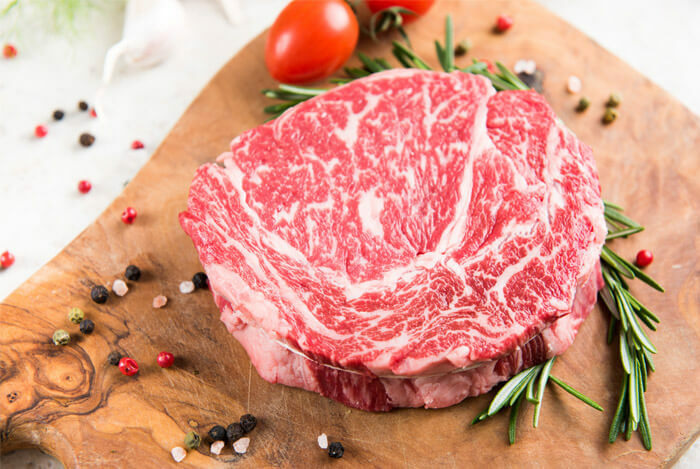 Beef serves up close to 5 mg of zinc for 30% of your DV in a 3.5 oz serving. 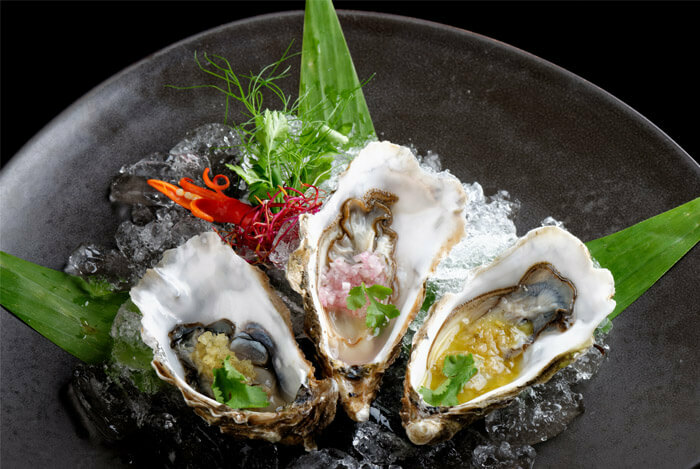 Whether you love them or get weirded out by them, oysters are one of the healthiest zinc sources on the planet, packing 33 mg, aka 220% of your DV, per half dozen. They’re also great for keeping the common cold away and boosting your chances of fertility. Is there nothing these little guys can’t do? Researchers in one study examined the visible signs of aging in 1,264 women and 1,655 men between 45 and 60 years old. 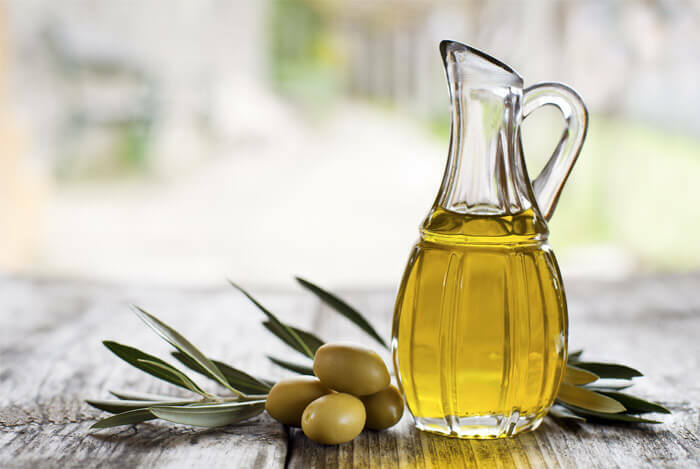 Using a “6-grade scale illustrated by photographs”, researchers noticed fewer signs of photoaging in participants who reported eating the highest amounts of olive oil. The antioxidant properties of the polyphenols in olive oil have been considered serious free radical fighters. To ward off inflammation and acne, give these oily, protein-packed little fish a chance. 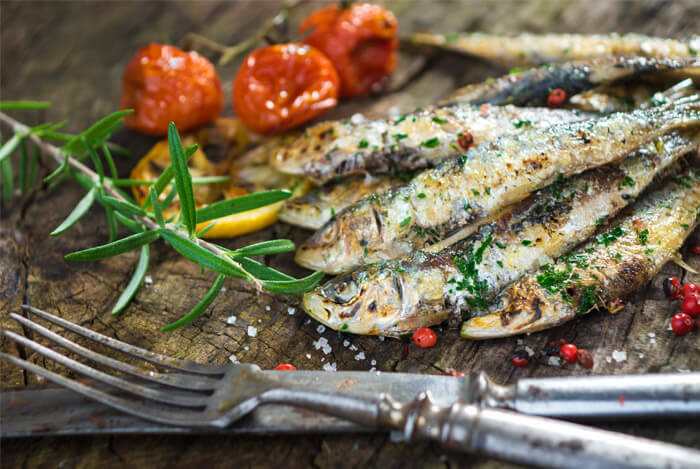 Sardines are high in omega-3’s and other nutrients. For every one tablespoon of sardine oil you’ll get 3.7 g of omega-3s. While all these foods will help you achieve smoother skin, they’re also super healthy for you. What’s your take on foods to improve skin health? Have anything else you’d like to share? Let me know in the comments below!